Last night Paul and I went a charity gig at the SupperClub london in glitzy West London. And what an amazing night it was. It was the 1980s come alive again. The Buggles were doing their first ever live gig, a mere 30 years after their début hit single, Video Killed The Radio Star. They were set to perform one of my favourite albums of all time; The Age of Plastic - in full for the first - and quite possibly, only - time ever. Also on the set list was an assortment of hits from Trevor Horn's back catalogue and some tracks with special guest vocalists. Very special as it turned out. Up first were OMD performing a couple of songs from their new album History Of Modern and then the wonderful Electricity, Joan Of Arc and Enola Gay. They were then joined on stage by their very own special and lovely guest, Propaganda / Act / Onetwo's Claudia Brücken who performed Duel with them. After a brief break The Buggles appeared for real and stormed the place. They did the first side of The Age Of Plastic album note perfect. Then we were treated to Alison Moyet joining The Buggles on stage performing the Yazoo classics Only You and Don't Go and an amazing cover of the Grace Jones smash Slave To The Rhythm . Richard O'Brien then joined The Buggles for two songs from Rocky Horror; Super Heroes and The Time Warp. And then we had 10cc's Lol Creme (who was an honorary Buggle for the night) performing I'm Not In Love with The Buggles as backing band. The Buggles then continued with the second side of the album including both versions of Johnny On The Monorail. Paul and I went mad for Clean, Clean.'Natch. As an encore the guys had one more special guest that had been kept secret until the last minute... Gary Barlow singing Otis Redding's Hard To Handle. 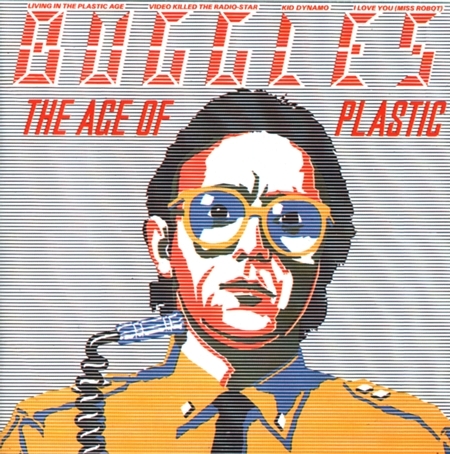 The Buggles then did a surprising cover of the Nicki Minaj / Will.i.am song Check It Out which itself heavily samples Video Killed The Radio Star - and Trevor Horn was doing the rap! Pop will indeed eat itself. The gig finished at midnight. Two hours and fifteen minutes of utter bliss. Paul and I were quite beside ourselves. Best. Night. Ever. Yes, we were there too and it far exceeded our expectations - the venue was small and we were right down the front so could even have played Paul Humphrey's keyboard for him! Great to see that the Age of Plastic holds up so well and that everyone was having such a good time. And how fabulous does Alison Moyet look now? Yes, she does look good, doesn't she?. And very happy. We were standing further back, dancing and taking lots of pictures and videos. Hopefully they'll come out OK.
Can you believe I was absolutely in blissful adoration looking at Trevor Horn playing and singing, 2 days ago? I was! Just announced: The Buggles will go on tour for the first time ever in 2012.